With cameras turning over more resolution year after year and with file sizes growing, you need more space for your deliverables. Many new computers don’t even have an optical drive and rely on cloud services, SD cards, or USB connections. So, this brings me to Photo Flash Drive. I first saw Photo Flash Drive at a PPA convention. I was like, That’s an excellent idea. 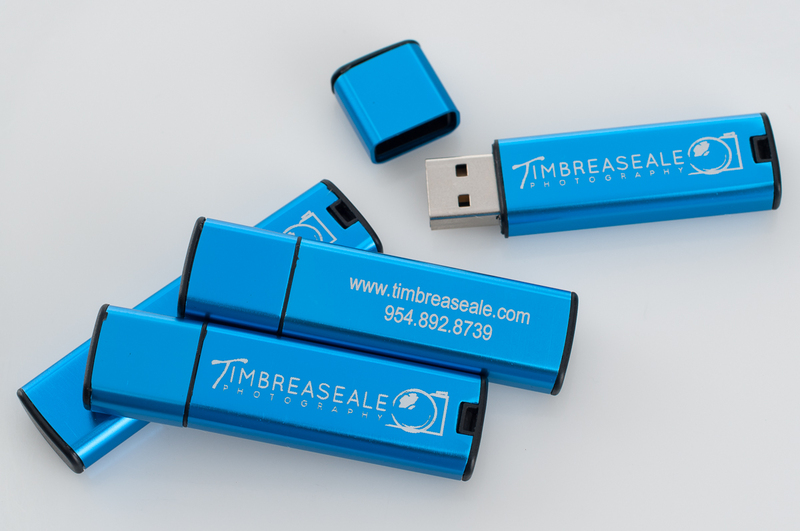 I thought about using thumb drives before, but they were a little pricey for what I was delivering to my clients. It wasn’t until I delivered a job that took 3 DVDs that I thought it was ridiculous having to deliver that many DVD’s with the client’s images broken down into several different folders spread across several DVD’s. The solution to that problem now is the inexpensive flash drives from Photo Flash Drive. 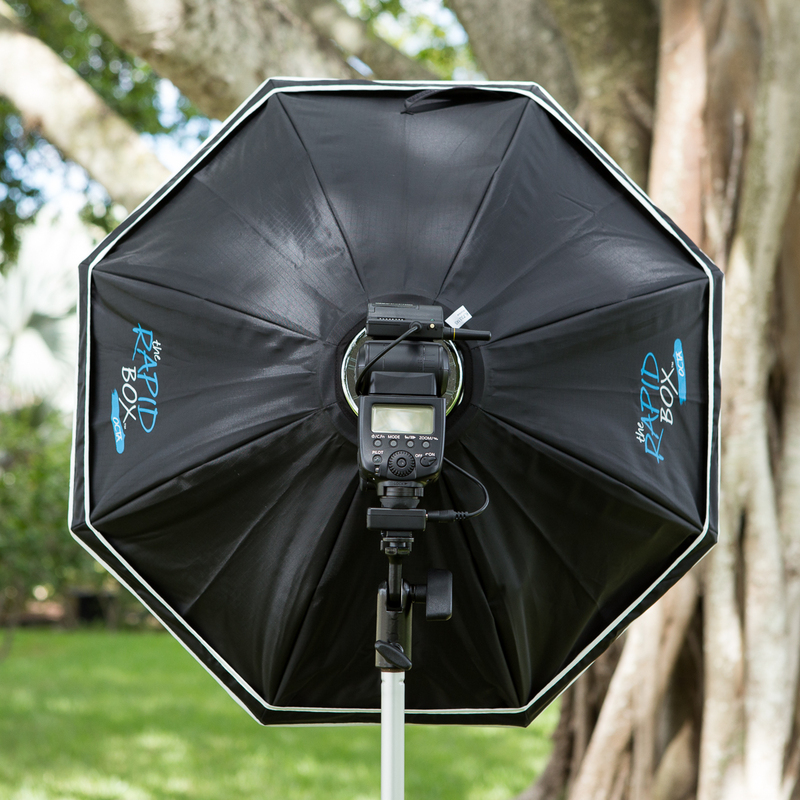 I recently booked a wedding and thought, This would be the perfect time to order some of Photo Flash Drive’s products to try out. 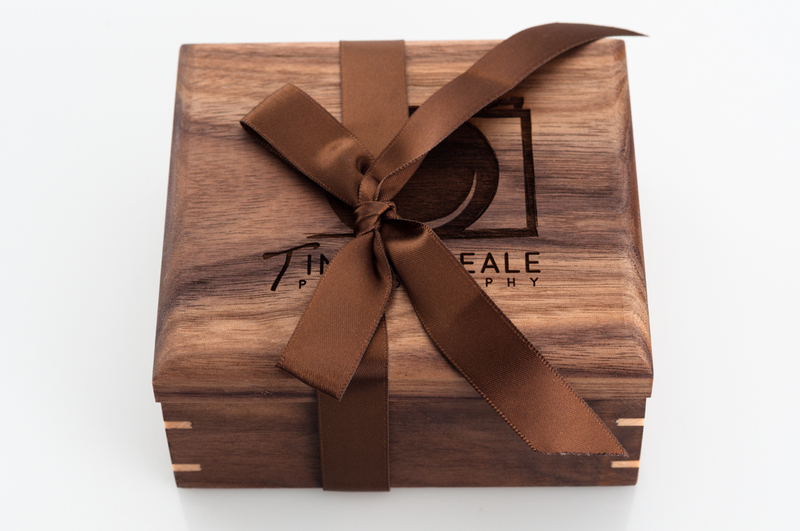 I was really interested in the wood swivel drive coupled with the premium wood box to deliver to my wedding client. 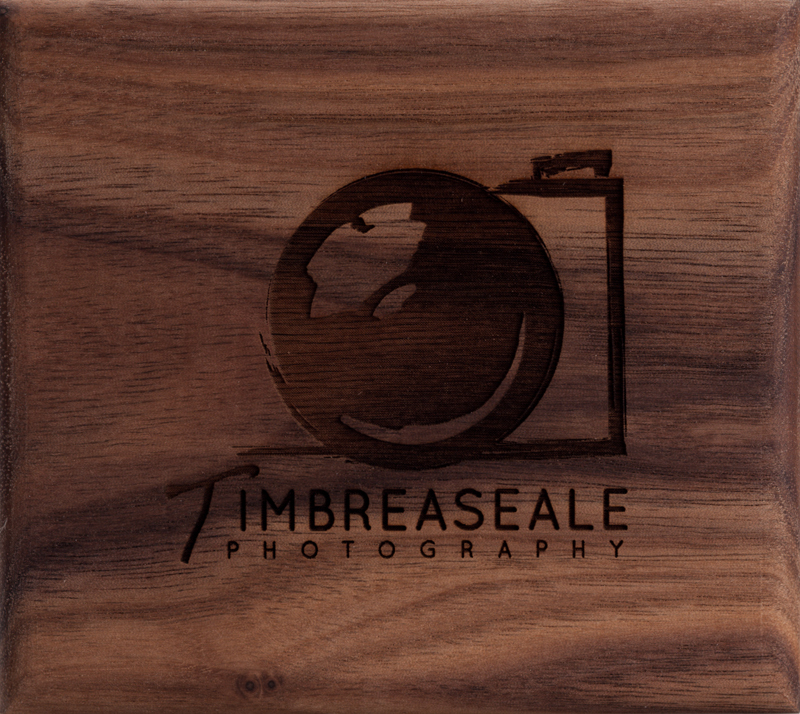 I also wanted to see how some of the other products looked with my logo engraved on them. Above is the custom metallic 4GB drive (many other storage capacities available). You are able to get your logo on one side and two lines of print on the other side. As you can see, my logo and lettering came out perfect. Below are a couple of other products I wanted to see. 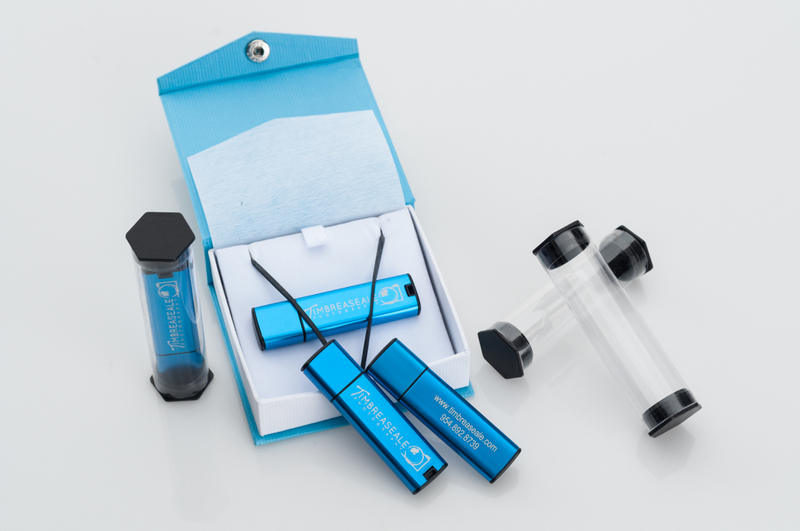 I have in mind using the acrylic tubes with a label for hand delivery or for mailing. This box shown is the Color Snap Box and is not customizable. I could see myself using this type of box for babies, senior portraits, or families. 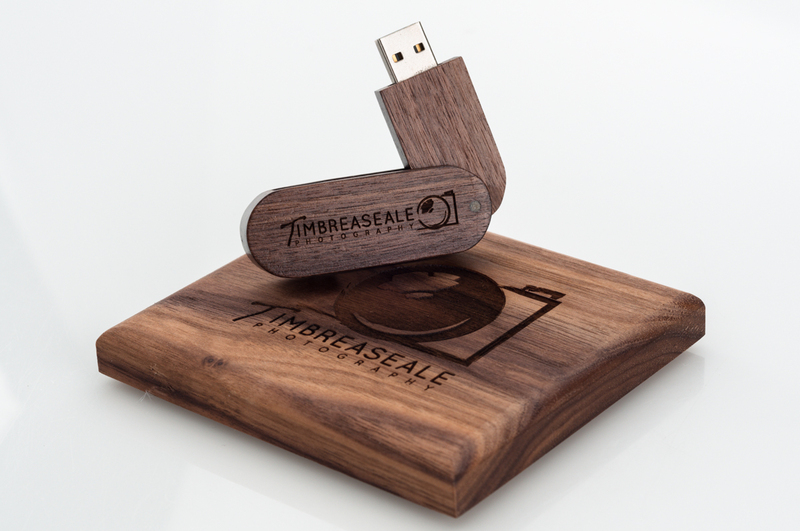 Photo Flash Drive has many other styles of boxes to choose from and are also customizable. Now for the main showcase. 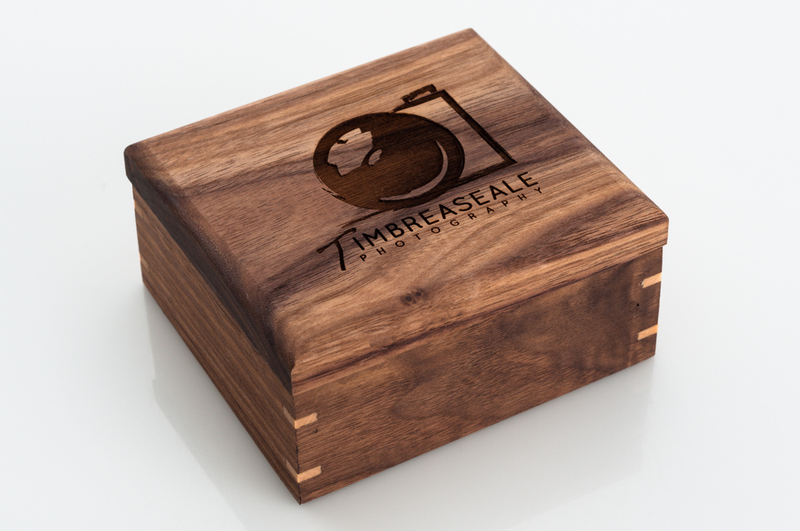 The premium wood box with the wood swivel drive, both in walnut color. I was surprised that the box came with a lovely bow. I love the detail of this box. 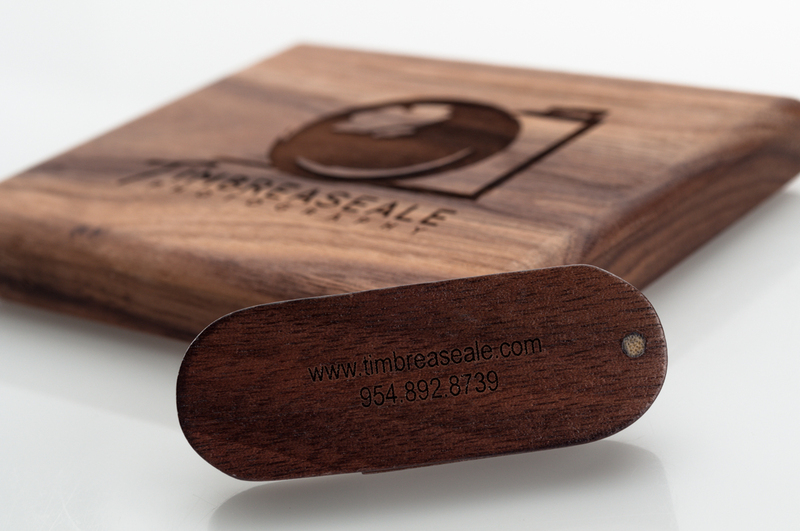 I love the dovetail corners, and I love the laser engraving of my logo on the box top. 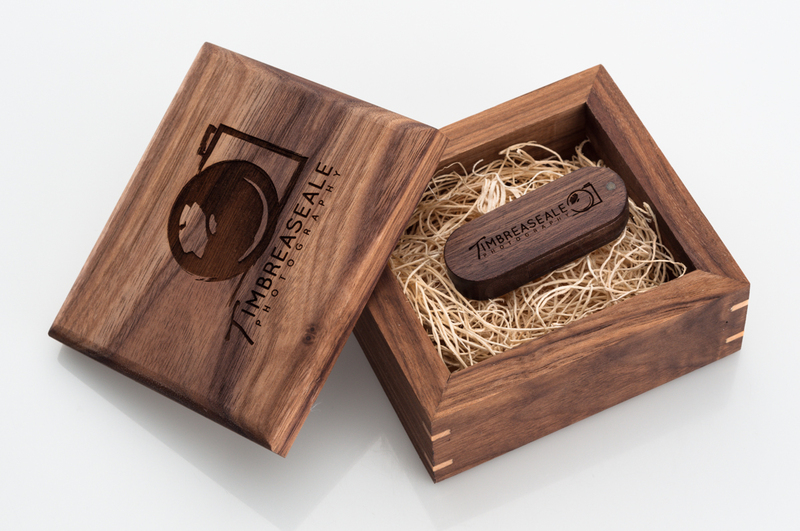 When you open the box, it’s filled with wood wool that’s used to give your companion drive a nestled fit. The engraving on the wooden swivel drive is just as amazing as the engraving on the box top and the metallic drives. Since the wedding I photographed was a last minute booking, my clients did not want a photo album. I thought this was the perfect gift to deliver their wedding images. There is no setup fee for engraving, I think my next event might be a little more personalized. I could personalize the box top with a different logo that more represents the occasion like wedding rings with the name and date of the couple or a baby rattle with the name and birth date. So many options! All the drives are Mac and PC compatible, use USB 2.0 interface, and have a lifetime warranty. The laser engraving on the drives appear with a whitish silver color. There are a lot of different color combinations to chose from with their plastic swivel drives. If you really need a lot of storage space, you can even get a portable custom hard drive. Don’t forget to finish off your drives with some awesome packaging. Many size boxes available with or without customization. If you need to order in bulk, then studio bundles and packs are also available. The more you buy, they cheaper they get. If you are tired of burning multiple DVDs for one job, or if you are tired of waiting 20 minutes for your Lightscribe to burn your logo on the DVD, then I highly recommend that you check out Photo Flash Drive. I am very happy with the quality of the products that I received, and I highly recommend using this vendor for your digital storage and deliverable needs.